Tarnia Hall had tried to lose weight so many times in her life and never was successful – she realised as she got older that she had been embarrassed about her size for a long time. In fact, she was so unhappy with her weight, she would not display her wedding photos because she felt she looked grossly overweight. In June 2013, Tarnia decided to take control of her health when she became a grandmother – she knew that she wanted to be able to keep up with her grandchild, so she gave The Natural Way a call. 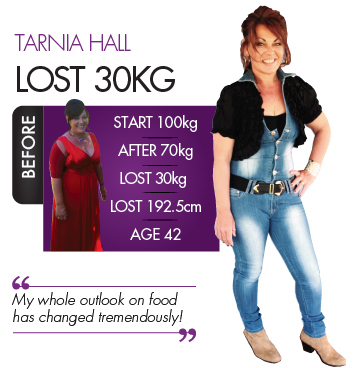 Tama, her The Natural Way consultant, knew that she could help Tarnia reach her ‘dream’ weight and Tarnia successfully lost 30kg (plus an extra few kgs)…which she has kept off to this day – how fabulous! What obstacles did you need to overcome to lose weight and how did you? “The day I decided that I was sick and tired of being overweight, I thought, ‘the only person who can help you is you’. So I took myself off to the Doctors had a full check up blood tests etc. All in all, I was quite well with a slight fatty liver from obesity. Then my next thought process was, ‘Ok what am I going to do about it?’ I made the decision that I wanted to change my eating habits and lose weight. I decided I needed help, so that is when I contacted The Natural Way. I had my consultation and decided The Natural Way was for me. My decision to ring The Natural Way was an exciting time for me; sharing that excitement is a natural thing to do (and I did). Since then, I have at times, been worn down by opinion and sabotage by others. Often, people have tried to tempt me with weight gaining food (they are the sabotagers) and heard them say things like, ‘One piece of cake won’t hurt you’. I have thought about it a lot over my weight loss journey and now understand these comments are a sabotagers’ way of not overcoming what it is they need to overcome. As I lost weight and talked with my consultant Tama I learnt about food, what’s in foods and the effects different foods had on my body, the more the sabotagers and opinions of others didn’t matter to me. I learned over time to realise it’s my body, it’s my weight loss and I own it. That all in turn kept me in a headspace to lose the weight and maintain it. Being in the WRONG head space is an obstacle in weight loss….but when I started I was definitely in the right head space to get rid of this excess weight. We never stop learning”. Do your homework on your body. Get a full check up from your doctor. Come to a decision. Focus on yourself. Don’t do it alone, and get the program you need to succeed. For me it was The Natural Way and still is! Ignore sabotagers and the opinions of others on your weight loss journey. Turn negatives into positives, which can be achieved with one on one consultations with The Natural Way. I’m 40kg lighter than I was at my heaviest. I’ve not only achieved weight loss, I am a much more positive& knowledgeable person. I’ve loved what I’ve achieved. I love what I’ve learned. I will keep learning. I will stay positive and I will keep The Natural Way close to my heart.